Stone type: coarse, sparkling yellow grit. 15.5'' high and 17'' broad. 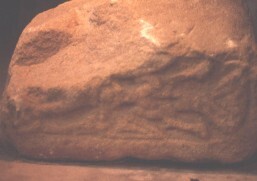 Left hand side of Shrine tomb, dated to the ninth century. This side is very defaced.